My list of what’s looking good in the garden this week is short, but I’m going to try to remember how stunning the last few stems of anemone coronaria and rosa “James Galway” are, and try to make more of them next November. I’m still looking for November combinations that please, to coincide with my daughter’s birthday at the end of October. With the advice of Clare from PlantPassion I think I’ve settled on fuschia as an anchor and potentially pots of winter-planted anemone coronaria to flower now, for a few shots of colour around the garden and in the last vases of flowers for the house. The deep, relentless snow of last January means I’m holding more tightly than ever to the fading November garden, as damp and slippery as it is. I need to be willing to let it go to sleep completely for 12 weeks. I tell myself that it needs a proper rest after the hyperbolic show of growth of the last nine months. And I should be grateful for the chance to look past its outer self, with the x-ray vision autumn offers, and into its bones: at the camellia “Black Lace” that’s lurked behind the towering Nicotiana sylvestris and cosmos all summer, slowly budding up at the foot of the climbing rose. Admittedly it was a thrill to pull away the dying things two weeks ago and see that the winter scene was ready for me: the camellia, the red stemmed cornus, the six-foot tree stump that a reluctant ivy is finally embracing, and the lanky arms of Etoile de Holland stretching out above it all, finally getting old and woody enough to thin a bit. Yes, I suppose I do appreciate that my garden tells no lies in winter. I am still feeling my way towards a design for this garden that feels balanced and always offers some degree of visual pleasure — a snack if not a feast — and winter is a unique chance to check my work. I’ve stared at this space so hard, for so many years now, that even the wet branches and fallen leaf mush of the well-planted bits thrill me, because I can see what they represent. Since I returned to a part-time schedule in July, my time at the desk is intense, working back-to-back on different client writing projects as I try to pack as much as possible into my hours. This has forced me to actively seek ways to relax during my 15 minute buffer breaks between projects. I make myself go outdoors, usually with clippers, usually to cut something I can bring back to the desk or leave outside on one of the small tables dotted about the garden. I only learn one or two things about gardening a year, and this is one of my 2010 discoveries: a vase of flowers left outside makes everybody happy. The flowers stay longer, the colours I like are brought closer together, the insects enjoy visiting them, and they make the seating places in the garden look so tempting that I’ve even sat in them. 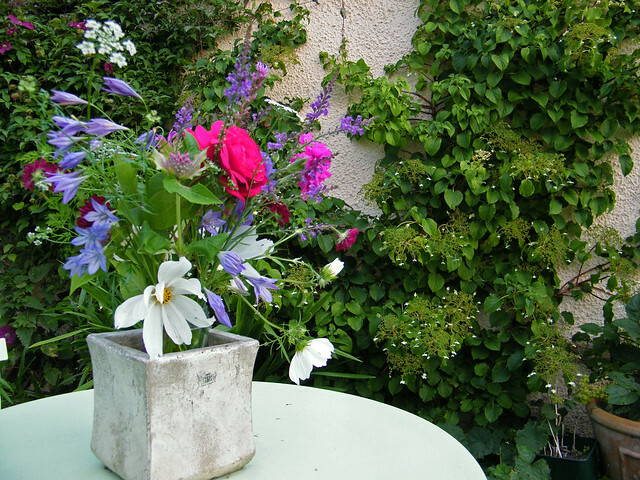 I’ve shown a few of my favourite vases from the garden here. Which appeals most to you, if any? Do you prefer to cut things for a vase, or leave them to die naturally in situ? I think November and December are the worst month in the garden. January brings the snowdrops, hellebores and Camilias. I would like an Autumn flowering Camilia but the last one I bought died even though I live in the south west. While I do appreciate the evergreens and berries I crave flowers! Still it will not be long and we can put up the Christmas decorations, if I can’t have colour outside… We don’t often get snow to decorate the garden the occasional sun is nice but is fleeting. Thanks Sylvia — it’s so wet that’s the worst, and the rotting remains of the summer, don’t you think? I’m trying to see all that decay as nutrients for the garden, although I’m sure molluscs are also cosy beneath it. I’m like you, completely craving flowers. I started my Christmas hyacinths absurdly early this year and they may actually do something for me at Christmas time inside. But I guess, like I was saying in the post, I’m trying to tell myself to stop it when it comes to November and December, and just let the garden rest; although I just can’t help needing to see beautiful things out my window. I’m not sure if you work at a computer, but if you have photographs of your garden on your PC or online, I strongly recommend John’s background switcher, which changes the desktop background on my computer every few minutes (or hours — you can set the interval) to be a picture from my garden slideshow set on flickr. I’ve got quite a big screen on my computer now, and even if I can’t look outside for something to cheer me up, I can always switch to desktop to have a glimpse of something lovely. It’s so annoying that your autumn flowering camellia died; I’m really putting great store of hope in mine this year. If I find something amazingly floriferous for outside in December and November, I will definitely let you know! I don’t mind the bleakness at this time of year. My borders all look forlorn and drippy and yet, when you look more closely, Daphne bholua is already budding up and I know we’ll have the first snowdrop showing white by New Year’s Day. So a bit of soggy, murky, brown melancholy is just right for now. But I love your outdoor vases – a great idea. Thanks Nigel – if only I could get the daphnes to grow here; the latest is transplanted from my mother in law’s house in Mull and is just a twiggy little thing, but at least it’s not dead. I was staring at the ground today where the snowdrops will be, eventually. What am I like?! I noticed outdoor vases in a spread in an otherwise awful gardening magazine and thought they were worth a try. I do like them. When I visited Mount Usher gardens in April in Ireland, they were selling stone-like square planters to hold small plants on outside tables, & the one I picked up there works perfectly: nice and heavy so it stays put, even in serious weather. Today, I hope, your garden looks wonderful covered in snow. I hear that a lot of Scotland has snow, do you? We get so little snow, that when we get some it makes up for the lack of flowers. I wouldn’t like months of snow but a light covering is beautiful. Not yet — but we’re all staring at the sky! There’s bright sun in the garden just now, coming sideways through the last few upright bits of crocosmia and aster foliage. Pretty but snowless! What a lovely idea. I wonder how some vases would go with the wind here? After many years of selling flowers in a florist I must admit to a preference for seeing them still on the plant. 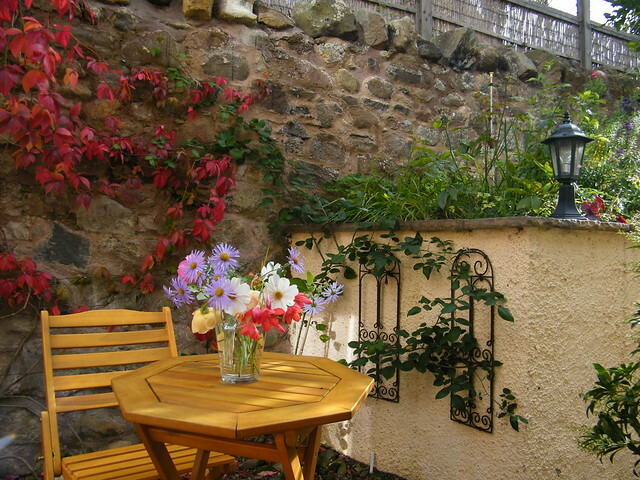 You have a super blog and a beautiful garden. 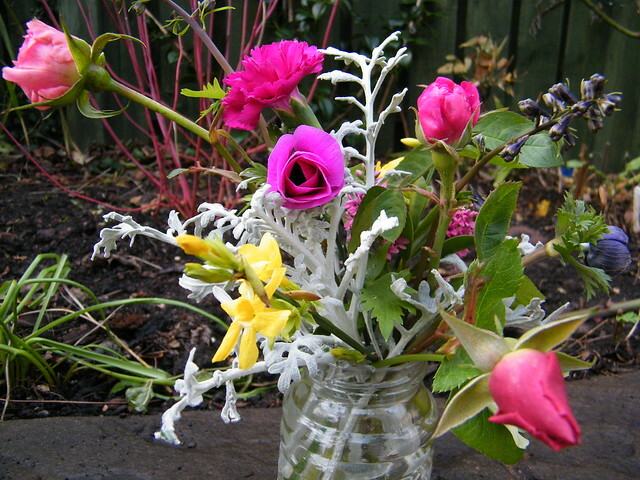 Thanks FSP – I use a heavy, stonelike little planter that I put my flower vases inside. It hasn’t blown away yet. I should think something good and heavy would stand up to your winds, providing they’re not gale force. I wish I was in Tasmania right now!